Russ Parr With a coast-to-coast radio, voice-over, television, comedic, and recording career spanning more than 20 years, Russ Parr's resume reads like an Academy Award nomination! 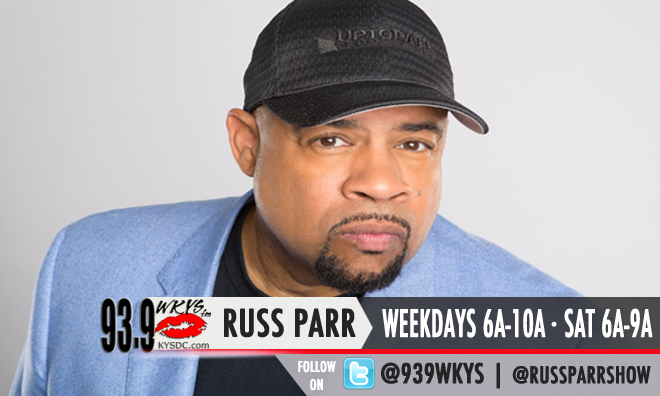 Russ is best known as the hilarious Host of the top-rated, nationally syndicated Russ Parr Morning Show, heard weekdays by millions of listeners in more than 30 cities across the country. In addition, his weekend show, "On The Air With Russ Parr", can be heard on more than 30 different radio stations nationwide. A man of many voices, Russ is known for doing amazingly authentic impersonations of Magic Johnson, Michael Jackson, Chuck D, Jesse Jackson, Barney and more on his morning show. His latest character, the slick-talking, debonair, "Sweet Peter Jeter," has become a favorite among female and male listeners alike. Though Russ Parr’s morning show is known for being light-hearted, make no mistake that serious subject matter is equally as important. Domestic violence, mental health, breast cancer awareness, registering tovote and countless other critical issues are regularly addressed on the nationally syndicated program which is based out of Washington, DC. For more than eight years, Russ was a professional stand-up comedian. The catalog of comedy albums he recorded under the character name "Bobby Jimmy and the Critters" sold millions. In fact, one of Russ'"Bobby Jimmy and the Critters" music videos was named Top Comedic Video by MTV in 1987. Russ has appeared in several television programs including "Martin", "NBC's Rockin' America", "Good MorningAmerica", "Jenny Jones", "BET Tonight", and a Showtime network comedy special, as well as national TV commercials for McDonald's, Kodak, and Thrifty. A Cal State University-Northridge graduate, Russ Parr has worked at legendary Los Angeles radio stations. During his stints in Dallas he worked at various radio stations and hosted FLAVA-TV, a popular video/variety show. Russ Parr’s wife and children are paramount in his life. His devotion to his family is paralleled only by his commitment to his listeners and community issues. Though many strive to be #1, few actually make to the top. As he reaches the pinnacle of his award-winning career, it’s clear that Russ Parr has worked hard to get where he is! Alfredas The youngest of 4 girls, Alfredas grew up in the heart of the Oak Cliff, Texas. More Libra than Virgo, Alfredas celebrates her birthday on September 22nd--no cards please, just jewelry. Alfredas has been in tons of national commercials and print ads for everything from J.C. Penny to Coca-Cola. She can also be seen in several movies including some you may have actually seen like 'Miss Congeniality' and Serving Sarah. Your kids might even be playing a video game with a voice that sounds distinctly familiar. Although she's done more acting than many actors, she doesn't consider herself an actress. She's a broadcaster through and through. Alfredas began her broadcasting career as an intern for FOX TV in Dallas. Bored out of her mind with the long hours and mundane tasks, she decided to give radio a try. While doing college radio – she was also getting her feet wet in real radio, working on The Russ Parr Morning Show in Dallas. ‘Working’ might not be the appropriate word. She was more like the unpaid gopher, responsible for immensely essential duties such as getting coffee, making Micky D runs, and answering request lines. Soon an entertainment reporting position became open and with her quick wit and entertaining but realistic attitude, Alfredas was offered the job. The 21 year old was now co-host and entertainment reporter for the Russ Parr Morning Show, which led to successful stints as co-host on local TV shows 21 Texas Jamz and Flava TV. After holding it down in Dallas for over 5 years with great ratings success, Alfredas decided it was time for a change...actually the powers-that-be decided to change the format, so Alfredas decided to change cities. It was off to DC to work in radio. Though she loved the experience, Alfredas had other things on her mind. You know, the usual have-babies-get-married thing. Well, let's just say the baby thing worked out great. But again bored out of her mind (or maybe crazed for adult companionship) she thought she'd give television another try. Cast as the entertainment reporter for a regional weekend television show called Nettalklive, she was back in business. It wasn't long before radio came calling. Alfredas became the "hardest working woman in showbiz", taking a morning co-host and news reporting position at KPTY FM in Phoenix, AZ and flying back to Dallas every weekend to report on Nettalklive. Alfredas was living her dream of doing both TV and radio, but the traveling was getting old, not to mention her radio contract was up, so it was back to the Lone Star State. By now Nettalklive was nationally syndicated by Belo as well as other syndicates, and Alfredas was promoted to host, writer and producer of the show. There was but one thing missing…radio, but not for long. Alfredas' long time friend and mentor was suddenly back in Dallas with a syndicated morning show and he needed a newsperson. Alfredas soon became the news director and anchor for KBFB FM in Dallas. In the meantime after 5 years, Nettalklive came to an end, as did Alfredas position as news director. She decided to pack up and go north to take a position as the entertainment reporter for the nationally syndicated Russ Parr Morning Show. There was but one thing missing…television, but not for long. Alfredas now hosts travel and gardening tips on TV One and is also co-host of the networks dating game show, Get The Hook Up. Alfredas stays busy with her career, husband and 2 boys but still manages to make time to be an active member of her community. Drawing on her soft spot for senior citizens and animals, she and her family are regulars at the senior citizen assisted living facility in her community (where her 11 year old TJ is a hit! ), and the whole family (yes, even 2 year old Jared) volunteer with local animal rescue and adoption centers. Supaken Bio coming soon. Albert "Sumbody Trippin" ALBERT aka “SumbodyTrippin” is a native Washingtonian. He is an alumni of The University of Maryland – College Park and Connecticut School of Broadcasting. Albert landed in the field of radio by first Interning with The Russ Parr Morning Show and being a Board Operator for Radio One’s Washington DC station 93.9 WKYS. Albert is know for his crazy laugh which you hear in the background. Albert was brought on the RPMS team in 2007 as a producer for the lowest rated show in the country.